EXCLUSIVE: Islay distillery Bruichladdich has kept its promise to publish on its website the recipe of casks used in each vatting of its core ‘The Classic Laddie – Scottish Barley’ NAS expression. 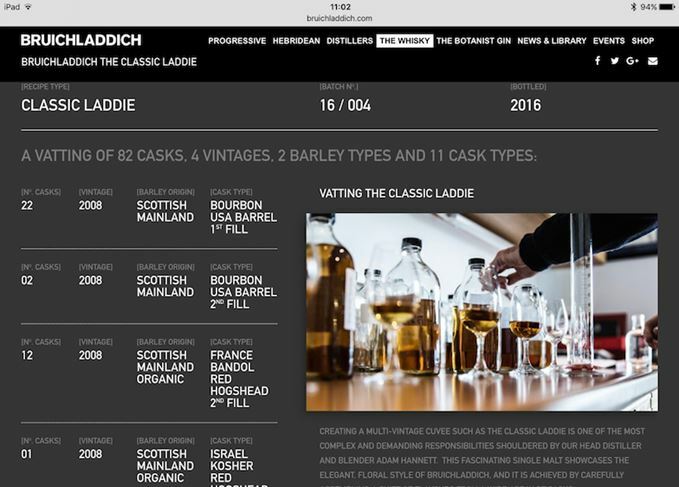 With immediate effect, anyone with a bottle of The Classic Laddie – Scottish Barley can input the batch code printed on the bottle into a field on the product page of the Bruichladdich website. This brings up a detailed recipe for the relevant vatting, showing the bottling date, number of casks of each type used, the vintage, the barley source and the cask type. Published in response to requests from the public, the information is currently available for the 37 bottlings and 18 recipes of The Classic Laddie – Scottish Barley, but not as yet for the earlier bottlings labelled ‘Scottish Barley – The Classic Laddie’. Bruichladdich promised to make the information available after pledging support in February for Compass Box’s campaign for increased transparency in the labelling and communication of Scotch whisky. However, the company said plans to release more detailed information about the vattings of The Classic Laddie had been under discussion for some time before Compass Box spoke out on the issue. Bruichladdich, which has the full support of French owner Rémy Cointreau, has emphasised its determination to provide greater transparency without breaking the existing law. The Scotch Whisky Association (SWA) has previously queried whether the move would be in violation of UK and EU legislation, which prohibits any communication of a whisky’s age, other than of its youngest component, and suggested that Bruichladdich sought advice from HMRC on the matter. A Bruichladdich spokesperson reiterated that the ‘recipe’ was not freely available, except to those with the relevant batch codes. ‘While we are fully supportive of the Compass Box transparency campaign, what we are doing is materially different to what they did,’ he added. ‘We are not purchasing whisky from third parties, or using brand names or identifiers used by third parties.